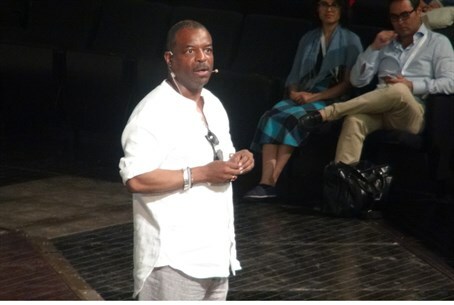 LeVar Burton of "Star Trek" fame visits Israel, participates in education through technology conference. Actor and producer LeVar Burton was among the speakers at the “Shaping the Future” conference taking place at the Center for Educational Technology. Burton has captured the admiration of both his audiences and his industry peers for three decades and continues to enjoy rare longevity in the entertainment business. Launching his acting career in the groundbreaking role of Kunta Kinte in the landmark television series “Roots”, Burton found himself on the cover of Time Magazine at 19. Shortly thereafter, he achieved further global acclaim as Chief Engineer Geordi LaForge in the “Star Trek: The Next Generation” television series and feature films. From 1983 until 2009, Burton was host and producer of the beloved Peabody Award-winning PBS children’s series “Reading Rainbow”. He recently reimagined the iconic series through his company RRKidz. In 2014 Burton was at the helm of a record-shattering Kickstarter campaign that will soon bring Reading Rainbow home and school versions to the web. Coming from a family of educators, his lifelong commitment to children’s literacy began early and has grown through his decades of work with Reading Rainbow. Israel is indeed a “start-up nation”, Burton said, and that “speaks to the truth that out of antiquity can come innovation”.